The man dubbed the "French Spiderman" has climbed a skyscraper in an effort to save Paris's crumbling Notre Dame cathedral. Alain Robert scaled the 185 metre-high glass-fronted building in the city's La Défense business district on Monday to raise funds needed to restore the landmark. 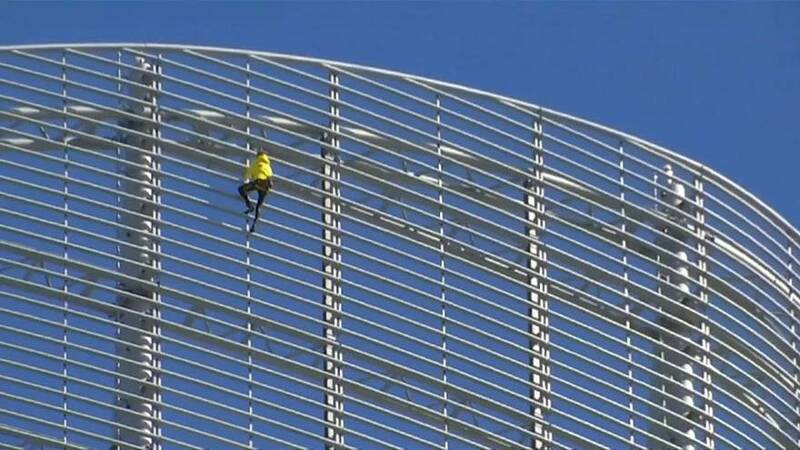 The 56-year-old, notorious for his death-defying climbs, climbed the Engie headquarters without a harness and was seen using horizontal struts running up the curved facade. Before the climb, he said he wanted to help fund the renovation of Notre Dame and that he hoped others would too. His sponsors were writing a cheque for €5,000, he added. The Archbishop of Paris is on a drive to raise more than €100 million to save the cathedral's crumbling gargoyles and gothic arches, on which pollution and the passing of time have wreaked havoc. Some 14 million people visit the 12th-century Parisian landmark every year, which is most famous in popular culture as the setting for 19th-century author Victor Hugo's The Hunchback of Notre-Dame, and the films of the same name including the 1939 classic with Charles Laughton and the 1996 Disney animated musical version. Robert was arrested shortly after completing Monday's climb. He has climbed more than 100 structures including the Golden Gate Bridge in San Francisco and the Burj al Khalifa in Dubai.